This page contains affiliate links from following affiliate partners. I will be compensated if you make a purchase after clicking on these affiliate links. My artwork also stands out wel on all kinds of wall art, my artwork is also available as framed prints. I leave the printing to Fine Art America, they do a fantastic job of printing on any kind of material. What fun it is to hang a beautiful framed print with my exclusive and happy art in public. Put a smile on people's faces, and distinguish yourself from the masses. Framed Prints, also do very well as a gift for a loved one. How special is that, an artistic framed print with your favourite artist's work on it. All framed prints are of outstanding quality! Hundreds of different frame and mat combinations. All framed prints are delivered ready to hang. The above framed prints and much more wall art products can be ordered through the Fine Art America widget above or through my Fine Art America website. 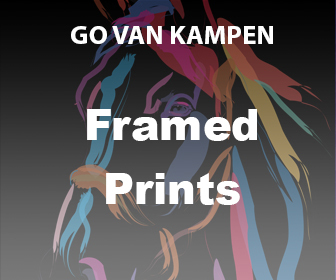 You can choose from framed prints, and further complement your order by choosing a frame-type and color, a mat, kind of paper and finish, with an exclusive art print of Go van Kampen. All framed prints are of high quality and produced using the latest printing techniques. Simply use the Fine Art America widget above, to buy one of my Art Framed Prints or to just continue shopping in my Fine Art America webshop. At Fine Art America you can pay securely by Paypal or credit card. Delivery of ordered products is between 3 to 4 business days and you have a 30-day money back guarantee. Symbol of strength, vitality, pride and intelligence.